John Lennon and Yoko Ono Declared 'Time's Up' – Way Back in 1972 . Beatles Radio: The Beatles, Solos, Covers, Birthdays, News The Fab 4 and More! response at that time was generally lukewarm — not surprising, considering back then the world was far from ready to acknowledge the mistreatment of females. Given the sea change that is currently in progress, John Lennon and Yoko Ono were ahead of their time. In 1972, they released Sometime in New York City, the first album where the two shared top billing. As an aural document of their lives in New York City, its content didn’t consist of songs about love and romance; instead the project targeted intolerance and injustice that the pair were witnessing through their association with key activists of the day, including Abbie Hoffman and Jerry Rubin. 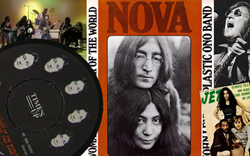 The song from that LP the pair chose to release as a single was stunningly contentious in its title and lyrics, both of which contained a racial epithet to get their point across: “Woman is the N––––– of the World.” John Lennon was a rare breed: a rock star who didn’t recoil from controversy.